to see my name among the list Aleida had for blogs that make her day. So now it is my turn to pass this along to the blogs that make my day! There are a lot of fun blogs out there to read and there are days where I've lost track of time after searching through blogland. 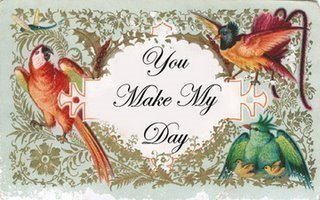 the rules for the *you make my day award* are to re-present it to 10 people whose blogs bring you happiness and inspiration and make you feel happy about blog land. let them know through email or by posting a comment on their blog so they can pass it on. beware you may get the award several times yourself, and if you do, consider yourself really, really loved.